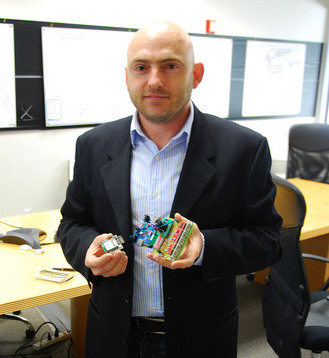 NanoSatisfi’s Peter Platzer holds a prototype ArduSat board, including the master controller, sensor suite, and camera (Credits: Evan Ackerman/DVICE). In recent years it has become both easier and more conceivable for students and amateurs to run experiments in space. Nongovernmental space organizations are on the rise, DIY spaceflight is all the rage, and it seems the web is full of videos filmed from atop weather balloons launching someone’s favorite figurine into the stratosphere. A recent project even allows consumers to use purchase points from American Express towards funding student experiments aboard the International Space Station. Cubesats, of course, were the original accessible space project. Designed for student use, Cubesats are small, standardized, and relatively quick to produce by amateurs. Cubesats evolved into the even smaller Nanosats, and the small satellites became a hallmark of graduate students and low budget outfits everywhere. But Cubesats have their drawbacks. Arranging a launch can be red-taped filled and expensive. Development frequently begins with one group of students and ends with another, with academic schedules not allowing the initiators to see the project through. The proliferation of Cubesats has also been of some concern to space debris watchers, since lowering the bar to space entry results in more small boxes hurtling through low Earth orbit looking for a target to hit. Cubesats generally have no propulsive capability, but do redeem themselves with a relatively short lifetime in low Earth orbits before being dragged into the atmosphere to burn up. 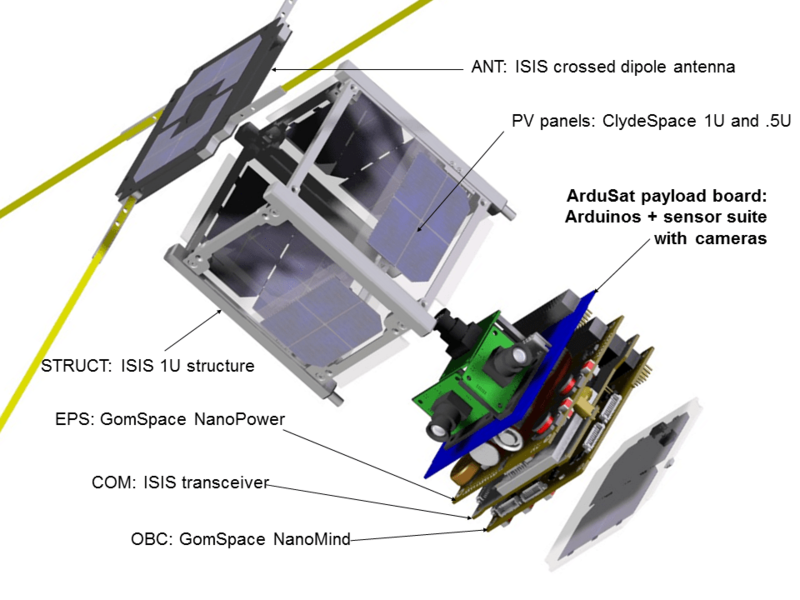 Exploded view of ArduSat (Credits: NanoSatisfi). One start up company thinks they’ve come up with a better approach. NanoSatisfi launched a Kickstarter initiative on June 15 for an open source Cubesat called ArduSat (although naming rights are available in return for a $10,000 donation). The plan is to allow members of the public to design their own orbital experiment, write their code, upload the program to ArduSat, and receive the results back – no hardware or launches involved. NanoSatisfi has loaded ArduSat with more than 20 sensors for every conceivable experiment and lined up partnerships with Discover Magazine among others to promote this new method of democratizing space access. “ArduSat offers two advantages over building your own Cubesat: time and money,” says NanoSatisfi CEO Peter Platzer. “In a best case scenario, you’re looking at a lead-time of 6-18 months to join a satellite group in a university. Programs can take as long as a few years from the idea of the satellite to its launch, so as a student you might never see your idea fly.” NanoSatisfi plans to take care of that lead time and the thousands of dollars of hardware and launch costs. “The end result is, for the individual user, you’re looking at weeks of lead time and a couple hundred dollars, as opposed to tens of thousands of dollars and years of waiting,” Platzer concluded. The company was formed when its four founders met at the International Space University in Strasbourg, France, and found that they had something in common. Platzer, a CERN to Wall Street physicist, Engineers Jeroen Cappaert and Joel Spark, and Marketing and Outreach Lead Reka Kovacs with a passion for enhancing space education, thought that they could do something to provide affordable, open-source space exploration for everyone – starting with themselves. 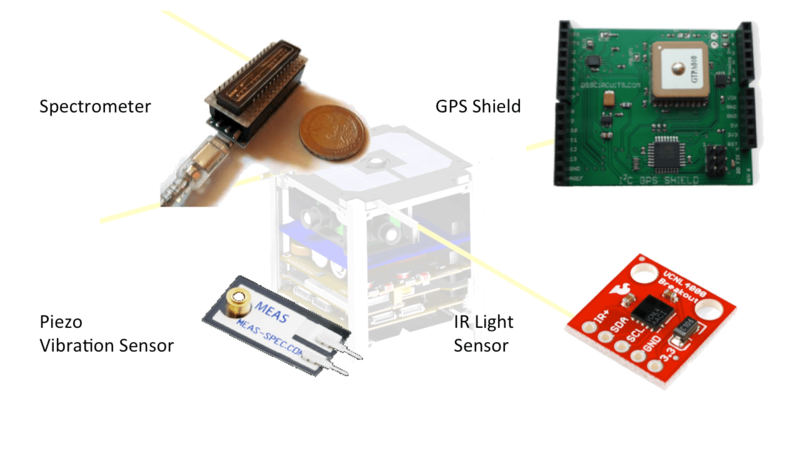 Some of the sensors that ArduSat will carry (Credits: NanoSatisfi). Some in the space industry seem to be taking note of the new company. On June 15, NanoSatisfi was named a finalist in the NewSpace2012 Business Plan Competition, worth $100,000. The competition is co-hosted by NASA and the Space Frontier Foundation to encourage entrepreneurs and technologists with new approaches to using space. And what about all that space debris? “Making provisions for deorbiting is particularly important for CubeSats,” says Platzer. “They’re typically around 10cm, on the lower threshold of what we can accurately track in orbit once they’re inoperative, yet they’re still large enough to be fatal to anything they hit.” NanoSatisfi assures its potential backers that ArduSat’s orbit, combined with its launch timing during a solar maximum, will ensure that it doesn’t hang around for long before burning up in the atmosphere. And, as Dvice journalist Evan Ackerman puts it: “you can totally rent the time slot corresponding with this occurrence and measure exactly what happens to the poor little satellite as it fries itself to a crisp.” And with one CubeSat accessible to upward of dozens of people who now need not launch their own, we might just see a reduction in that short-lived debris.